At St. Andrew's we are a caring, spirit-filled community of faith. We foster Christian development and engage all people on their unique journey of faith. Our ministry has a small town, family feel and we welcome one and all. Keep scrolling - there's lots going on! ​Service to be held at town side of the bridge. 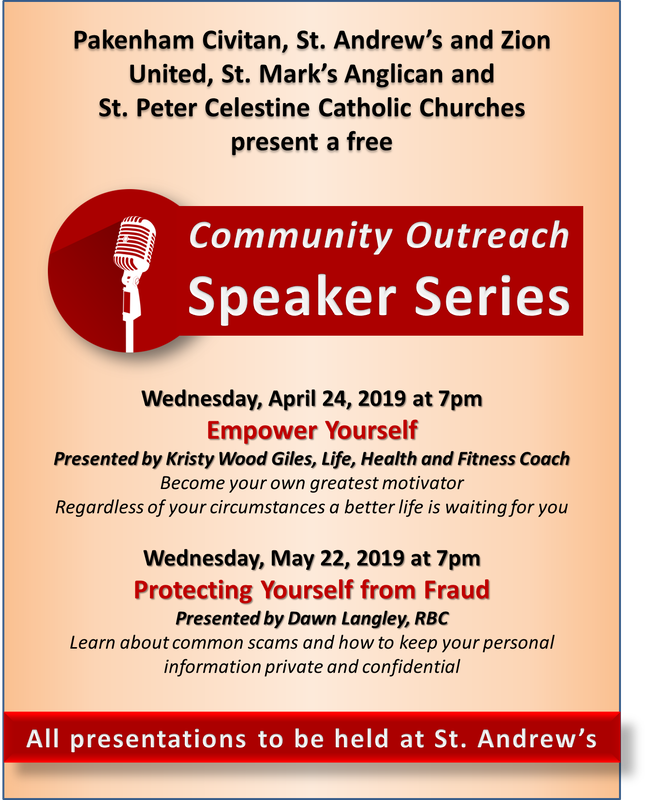 In the true sense of community the Civitan and local churches are partnering to bring you a free speaker series. Come out and hear great speakers talk about things that are important to you and your family. Stay tuned for the fall line-up! Our donations to the Food Bank have dropped off. To get us all re-energized we have a challenge for you. We are going to do our best to fill Cathy's car with non-perishable items. So, challenge your family, your co-workers, your neighbours to help us fill Cathy's car. Help kick start spring by filling the Food Bank's pantry. Featuring the lush vocals of Shann Bailey and the original songs of Timothy Trieste, from the group's adult contemporary album, the concert features a 5-piece band with some of Ottawa and Toronto's most accomplished musicians. With styles ranging from singer-songwriter, to adult pop, to jazz, the concert aspires to also be a real stage show with a series of unique narrations which tie the songs together, featuring short stories written for the stage from Trieste's forthcoming book. The poetic songs and stories weave together the big themes of existence: love, loss, our purpose in nature and the greater universe, and the personal experiences we all share in making our way through life. Tickets go on sale April 1st, 2019. 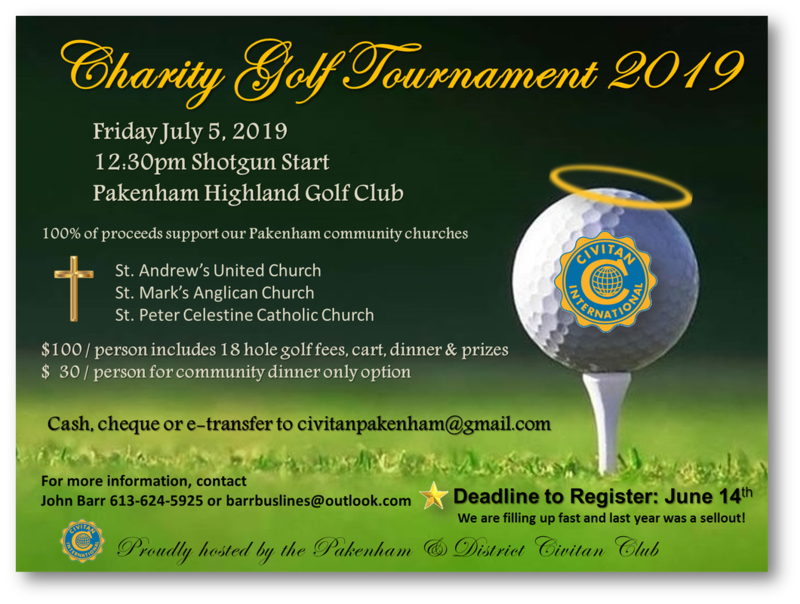 Support the Pakenham Civitan in their Support of Us! WOW! How great is this! 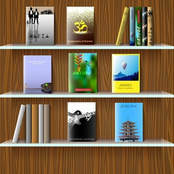 The Book Store in Stewart Hall has lots of books if you are looking for a good read. Thanks for donating your old books so others can enjoy them while supporting the Sunday school Food Grains Project. If you have children's books please bring them in - they go really quickly! In 1840, the first congregation of St. Andrew’s United Church of Pakenham gathered together in worship. The people in that first congregation, made up of predominantly pioneering families from Ireland and Scotland, had sailed across the Atlantic, then up the St. Lawrence by steamer to Brockville, then by foot to Perth and finally through rough forest trails to their parcels of land in Pakenham. For the 175 years since that first gathering, subsequent generations have continued the tradition of worship with determination, faith, love and a strong sense of community. To this day outreach remains the heart and soul of our faith family. Whether you're already part of our community or just visiting we hope our website will help tell the story of who we are. You are welcome at St. Andrew's for worship, musical and special events and of course for our famous country church suppers. For our full history click here. Our recent history in photos.